A NEWLY-discovered diary of a young Jewish woman has shed a haunting glimpse on her life in a Dutch prison camp in World War II before she was sent to her death, in an echo of the Anne Frank diaries. "Even though everybody is very nice to me, I feel so lonely. Every day we see freedom from behind barbed wire," Helga Deen wrote in extracts made public this week by archivists in Tilburg, in the southern Netherlands. CONCLUSION: Dead is dead. But gas-chamber sells more books than typhus. What does this tell us, fundamental, about the gas chamber statistics of Auschwitz?. 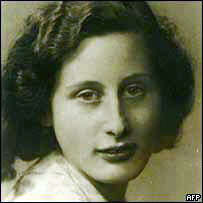 She wrote the diary in 1943, at the age of 18, after she was taken to the Vught detention centre nearby. It recalls the document left behind by Anne Frank, another teenager living in the German-occupied Netherlands, which was published after her death and has since become a potent symbol of the Holocaust, the Nazi slaughter of millions of Jews. Helga Deen was a pupil at a Tilburg secondary school when she was arrested and taken to Vught, which was infamous in the Netherlands as a transit camp on the way to Nazi death camps in Germany and Poland. "This is an extraordinary find. Very few diaries have been written in the camps because of the conditions of life there," David Barnouw of the Dutch NIOD institute for war documentation told AFP. "If diaries were written in the camps they were rarely recovered, because people's luggage was taken away when they were deported," he explained. 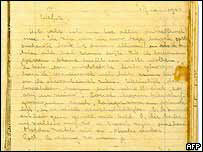 Deen's diary is only the third so-called camp journal discovered in the Netherlands, and the first written by a woman. In it, she wrote about how the prisoners were deloused and children put on transport. "Transport. It is too much. I am broken and tomorrow it will happen again. But I want to (persevere), I want to because if my happiness ... and willpower die, I too will die." Deen, who wrote the journal for her boyfriend, hoped she could escape the transports through work, but was told in early July 1943 that her family would be on the next train. "Packing, this morning a child dying which upset me completely. Another transport and this time we will be on it," she wrote. It was her last diary entry. Deen was deported to Sobibor, where she was recorded as having died on July 16, 1943 together with her parents and her brother. How the diary was smuggled out of the detention camp and survived all these years is "an absolute mystery," according to the Tilburg archivists. The journal was brought in by the son of Helga's wartime boyfriend Kees van den Berg. He found the green notebook with diary entries in pencil in a brown purse together with a lock of hair and a fountain pen. "The purse was like a religious relic for my father. Nobody could touch it," Van den Berg's son Conrad told the Brabants Dagblad paper. Deen's diary will be shown to the public at an open day on October 30. The Tilburg archive is looking into publishing it in May next year. "We will celebrate the 60th anniversary of the liberation and that will be a good moment to publish the journal," Gerrit Kobes of the Tilburg archives told the Dutch ANP news agency.